For further reference, it may be that the problem of the noncommutative BCH is related to, or could benefit from the solution of the KW conjecture given by Alekseev and Torossian. So it is a very hard problem, maybe. I come back to a problem alluded in a previous post, where the proof of the Baker-Campbell-Hausdorff formula from this post by Tao is characterized as “commutative”, because of the “radial homogeneity” condition in his Theorem 1 , which forces commutativity. Now I am going to try to explain this, as well as what the problem of a “noncommutative” BCH formula would be. Take a Lie group and identify a neighbourhood of its neutral element with a neighbourhood of the element of its Lie algebra. This is standard for Carnot groups (connected, simply connected nilpotent groups which admit a one parameter family of contracting automorphisms), where the exponential is bijective, so the identification is global. The advantage of this identification is that we get rid of log’s and exp’s in formulae. Then we have as . Denote by the Lie bracket of the (Lie algebra of the) group with initial operation and likewise denote by the Lie bracket of the operation . The relation between these brackets is: . Remark that (2) looks like a valid definition of the Lie bracket which is not related to the group commutator. Moreover, it is a formula where we differentiate only once, so to say. In the usual derivation of the Lie bracket from the group commutator we have to differentiate twice! Let us now pass to a slightly different context: suppose is a normed group with dilations (the norm is for simplicity, we can do without; in the case of “usual” Lie groups, taking a norm corresponds to taking a left invariant Riemannian distance on the group). uniformly with respect to in an arbitrarry closed ball. – , uniformly with respect to in a closed ball, and moreover implies . 1. In truth, everything is defined in a neighbourhood of the neutral element, also has only to be a local group. Also we have the distributivity property , but generally the dot operation is not commutative. 3. A Lie group with a left invariant Riemannian distance and with the usual multiplication by scalars (after making the identification of a neighbourhood of the neutral element with a neighbourhood in the Lie algebra) is an example of a normed group with dilations, with the norm . Then we have , for any and for any . Carnot groups are therefore just a noncommutative generalization of vector spaces, with the addition operation $+$ replaced by a noncommutative operation! 5. There are many groups with dilations which are not Carnot groups. For example endow any Lie group with a left invariant sub-riemannian structure and hop, this gives a norm group with dilations structure. (so the solution is unique) where the sum is taken with respect to the group operation (noncommutative series). Notice that there is NO CHANCE to have a limit like the one in (2), so the problem seems hard also from this point of view. which is normal, if we think about as being a kind of noncommutative vector space, even of may be not commutative. So this noncommutative Lie bracket is not about commutators! which is no longer visible now. But maybe it deserves a post here, because is my oldest attempt to understand differential calculus as an abstract matter and to look to new forms of it. by Pierre Pansu. It was only luck that in 2000, at Lausanne, I met Sergey Vodop’yanov (from Sobolev Institute of Mathematics). He started to explain to me what Carnot groups are and I was thrilled to learn that examples I needed previously are numerous in sub-riemannian geometry. With the right frame of mind (at least I think so), that of intrinsic dilations, I started then to study sub-riemannian geometry. We introduce the combinatorial notion of posetted trees and we use it in order to write an explicit expression of the Baker-Campbell-Hausdorff formula. The paper may be relevant (check also the bibliography!) for the subject of writing “finitary“, “noncommutative” BCH formulae, from self-similarity arguments using dilations. Let us go back to the original statement for which Korzybski is most famous—the statement that the map is not the territory. This statement came out of a very wide range of philosophic thinking, going back to Greece, and wriggling through the history of European thought over the last 2000 years. In this history, there has been a sort of rough dichotomy and often deep controversy. There has been violent enmity and bloodshed. It all starts, I suppose, with the Pythagoreans versus their predecessors, and the argument took the shape of “Do you ask what it’s made of—earth, fire, water, etc. ?” Or do you ask, “What is its pattern?” Pythagoras stood for inquiry into pattern rather than inquiry into substance.1 That controversy has gone through the ages, and the Pythagorean half of it has, until recently, been on the whole the submerged half. We say the map is different from the territory. But what is the territory? […] What is on the paper map is a representation of what was in the retinal representation of the man who made the map–and as you push the question back, what you find is an infinite regress, an infinite series of maps. The territory never gets in at all. Always the process of representation will filter it out so that the mental world is only maps of maps of maps, ad infinitum. Or we may spell the matter out and say that at every step, as a difference is transformed and propagated along its pathways, the embodiment of the difference before the step is a “territory” of which the embodiment after the step is a “map.” The map-territory relation obtains at every step. Inspired by Bateson, I want to explore from the mathematical side the point of view that there is no difference between the map and the territory, but instead the transformation of one into another can be understood by using tangle diagrams. Let us imagine that the exploration of the territory provides us with an atlas, a collection of maps, mathematically understood as a family of two operations (an “emergent algebra”). 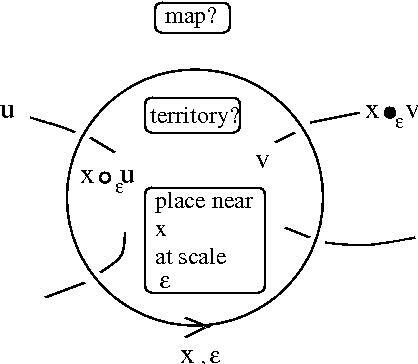 We want to organize this spatial information in a graphical form which complies with Bateson’s footnote: map and territory have only local meaning in the graphical representation, being only the left-hand-side (and r-h-s respectively) of the “making map” relation. In the figure from the left, the “v” which decorates an arc, represents a point in the “territory”, that is the l-h-s of the relation, the “u” represents a “pixel in the map”, that is the r-h-s of a relation. The relation itself is represented by a crossing decorated by an epsilon, the “scale” of the map. The opposite crossing, see figure from the right, is the inverse relation. is seen both as territory (to explore) and map (of it). In such a diagram the convention map-territory can be only local, around each crossing. In this diagram, all crossings which are not decorated have “epsilon” as a decoration, but this decoration can be unambiguously placed near the decoration “x” of the closed arc. Such a diagram will bear the name “infinitesimal place (or chora) x at scale epsilon”. why the Baker-Campbell-Hausdorff formula can be deduced from self-similarity arguments (showing in particular that there is another interpretation of the Lie bracket than the usual one which says that the bracket is related to the commutator). This will be posted on arxiv soon. UPDATE: see this post by Tao on the (commutative, say) BCH formula. It is commutative because of his “radial homogeneity” axiom in Theorem 1, which is equivalent with the “barycentric condition” (Af3) in Theorem 2.2 from “Infinitesimal affine geometry…” article. a gallery of emergent algebras, in particular you shall see what “spirals” are (a kind of generalization of rings, amazingly connecting by way of an example with another field of interests of mine, convex analysis). In the series of posts on Hilbert’s fifth problem, Terence Tao defines a Gleason metric, definition 4 here, which is a very important ingredient of the proof of the solution to H5 problem. The escape and commutator properties are meant to capture “Euclidean-like” structure of the group. Other metrics, such as Carnot-Carathéodory metrics on Carnot Lie groups such as the Heisenberg group, usually fail one or both of these properties. The conclusion is that the right translations in the group are Lipschitz (with respect to the Gleason metric). Because this distance (I use “distance” instead of “metric”) is also left invariant, it follows that left and right translations are Lipschitz. Let now G be a connected Lie group with a left-invariant distribution, obtained by left translates of a vector space D included in the Lie algebra of G. The distribution is completely non-integrable if D generates the Lie algebra by using the + and Lie bracket operations. We put an euclidean norm on D and we get a CC distance on the group defined by: the CC distance between two elements of the group equals the infimum of lengths of horizontal (a.e. derivable, with the tangent in the distribution) curves joining the said points. The remark 1 of Tao is a consequence of the following fact: if the CC distance is right invariant then D equals the Lie algebra of the group, therefore the distance is riemannian. Here is why: in a sub-riemannian group (that is a group with a distribution and CC distance as explained previously) the left translations are Lipschitz (they are isometries) but not all right translations are Lipschitz, unless D equals the Lie algebra of G. Indeed, let us suppose that all right translations are Lipschitz. Then, by Margulis-Mostow version (see also this) of the Rademacher theorem , the right translation by an element “a” is Pansu derivable almost everywhere. It follows that the Pansu derivative of the right translation by “a” (in almost every point) preserves the distribution. A simple calculus based on invariance (truly, some explanations are needed here) shows that by consequence the adjoint action of “a” preserves D. Because “a” is arbitrary, this implies that D is an ideal of the Lie algebra. But D generates the Lie algebra, therefore D equals the Lie algebra of G.
If you know a shorter proof please let me know. UPDATE: See the recent post 254A, Notes 4: Bulding metrics on groups, and the Gleason-Yamabe theorem by Terence Tao, for details of the role of the Gleason metric in the proof of the Hilbert 5th problem.